Here are this month’s stats on the popularity of the different software stacks available in Jelastic. So, let’s look at the charts for this month. 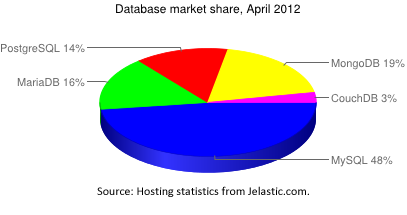 Below is the overall usage of databases within Jelastic for April 2012. 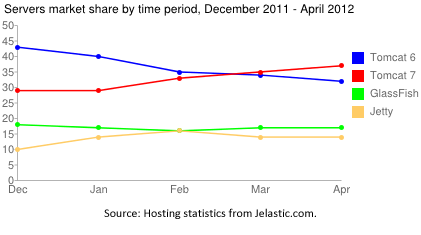 The current leader, MySQL continues to increase its share and shows no sign of slowing down. If we look at the database popularity by region, we see that CouchDB has dropped a spot in Europe: a 3% decrease over April. 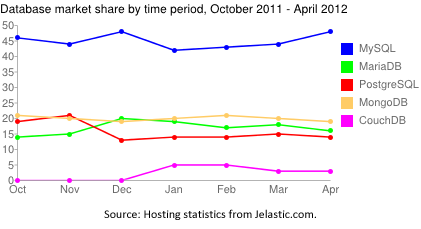 Below is a chart showing database usage within Jelastic from October 2011 through April 2012. The popularity of our new leader in the application server category – Tomcat 7 – continues to grow. If we look at the percentage share of other app servers, we see that the overall usage has stayed about the same. Overall, there really aren’t any huge changes in server popularity this month when looked at by region. 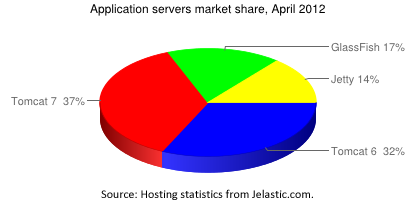 Here is a chart looking at application servers usage over the last 7 month, from October 2011 through April 2012. We decided to try something new. 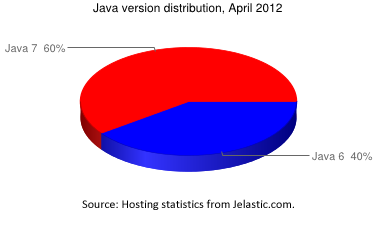 We made Java 7 the default choice this month and, as you can see, it made a huge difference in JVM popularity. Java 6 still has a few more fans in Europe and Java 7 continues to be more popular in North America, as you can see below. And finally, here is a Java version popularity chart for the last 7 months. Keep in mind that large jump is most likely due to making Java 7 the default choice. Hope you found this useful! Stay tuned to see the changes next month!